Scooby-Doo began in 1969 with an animated television series by Hanna-Barbera Productions called Scooby-Doo Where Are You? 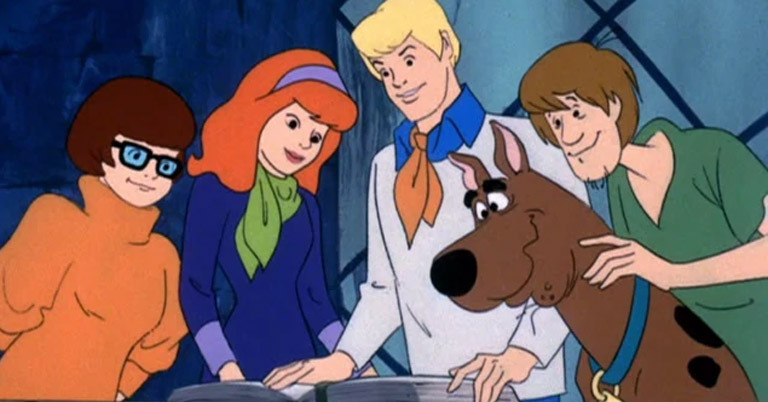 It revolves around four teenagers: Norville “Shaggy” Rogers, Fred Jones, Velma Dinkley, Daphne Blake and their Great Dane, Scooby-Doo, who solve mysterious crimes. He’s no ordinary dog! Scooby is Shaggy’s lifelong companion and friend and the duo share many personality traits. Famous for his catchphrase, “Scooby-Dooby-Doo!”, Scooby’s personality is a mix of human and canine behaviour and he’s treated as an equal by his human friends. The crime-fighters travel around the country in their psychedelic van, affectionately called the Mystery Machine, hot on the trail of apparently supernatural creatures, ghosts and things that go bump in the night. Of course, as all fans will know, invariably the villains end up being a twisted human being wearing a scary costume! Whenever Scooby and the gang finally catch up with a mummy or a ghost, off comes the creature’s mask and it’s usually the janitor, shaking his fist at those “pesky kids” who have ruined his master plan! After the success of the original series, there have been a multitude of follow-up series, spin-offs, TV specials and films with live actors, while extra characters have been introduced, including Scooby’s nephew, Scrappy-Doo. In every series and film, Scooby and Shaggy share the personality traits of being cowardly and continually hungry. Their friends encourage them to go after the “baddies” by bribing them with “Scooby Snacks”, which are bone-shaped dog treats. Scooby is so loyal to Shaggy that he usually overcomes his fears without any prompting and takes a heroic stance to save his human pal. Scooby’s voice is a mixture of dog barks and human speech, which everyone seems to understand, although sometimes he uses charades to explain longer sentences. When he’s scared, one of Scooby’s favourite tricks is leaping through the air and landing in Shaggy’s arms. Despite being skinny, Shaggy’s always able to support his canine pal. The Mystery Machine is the key to all of their crime-fighting expeditions, as the gang are able to set off on road trips as part of their amateur sleuthing escapades. The Mystery Machine has changed shape over the years and has been modelled on several different types of vehicle, including a VW or Corvair Van, a Chevy G10 and a Ford Econoline. The van is more of a generic vehicle, with features from several models, so it isn’t specifically like any one real automobile. The modern series of Scooby-Doo has changed its traditional format somewhat. In 2010, new series Scooby-Doo: Mystery Incorporated was launched and it appeared to be trying to bring the plot into the 21st century. The Mystery Machine was still the mainstay of the plot and transported the amateur sleuths to the scene of the crime. However, instead of the four humans simply being good friends, Fred and Daphne are engaged and Velma is going out with Shaggy. Perhaps the biggest change is that there really are some supernatural creatures stalking our heroes! The Evil Entity is a mass of eyeballs and writhing tentacles, as it tries to destroy the universe, while Charlie the Haunted Robot actually turns out to be a haunted robot when the gang try to unmask him. Meanwhile, a bunch of scary alien creatures called the Anunnaki, who have travelled to earth from another dimension to take over animals’ bodies and fulfil their invasion, are enough to have everyone jumping into Shaggy’s arms! Scooby enthusiasts have been a little unhappy about the changes and have demanded the traditional plots are restored, with the slimy monster being unmasked as a jaded janitor, rather than an actual alien being! In May 2018, it was announced a new Scooby-Doo series, entitled Scooby-Doo and Guess Who, is planned for release some time in 2019. For would-be ghoul hunters out there (and anyone else who needs a van! ), why not indulge in a mystery machine of your own from H&H Van Sales? We have a variety of vans to choose from, and if there’s particular vehicle you have in mind and it’s not already on our forecourt, we will try our very best to source one for you. Please call 020 7916 6616 for further details.